Background: Diabetes mellitus is a metabolic disease that leads to elevated levels of adipokines. Objectives: The aim of this study was to investigate the effect of eight weeks of combined exercise on retinol binding protein 4 (RBP4), fatty acid-binding protein (FABP) and lipocalin-2 in diabetic women. Methods: In this semi-experimental study, 18 diabetic women referred to the Bojnourd Diabetes Association were selected and divided into two groups of combined training and control. The combined training group performed resistance and endurance training for eight weeks, three sessions per week and each session for 60 minutes. The control group only had their daily routine. Before performing the pre-test and at the end of eight weeks, 5 cc of blood from the brachial vein of all the subjects was taken in fasting state. Data were analyzed by covariance, independent samples t-test and paired sample t-test. P value less than 0.05 was considered significant. Results: Eight weeks of combined training had a significant effect on reducing FABP (P = 0.02) and RBP4 (P = 0.01) in diabetic women. However, there was no significant effect on lipocalin-2 in diabetic women (P = 0.86). Conclusions: It seems to that diabetic women can implement eight weeks of combined resistance and endurance training to improve their serum levels of RBP4 and FABP. Diabetes mellitus is a metabolic disorder with heterogeneous symptomology characterized by chronic hyperglycemia and a metabolism disorder of carbohydrate, fat and protein due to defective insulin secretion, insulin action, or both (1). The global prevalence of this disease was estimated at 366 million people in 2011, and this rate may reach 552 million by 2030 (2). Type 2 diabetes is usually associated with abnormal production of adipokines (3). Specifically, increased blood levels of some adipokines is associated with cardiovascular complications in diabetic patients (4). Lipocalin family proteins include retinol binding protein 4 (RBP4), fatty acid-binding proteins (FABP) and lipocalin-2 (ln2). Research suggests that these proteins as novel inflammatory markers affect signaling pathways in patients with obesity and type 2 diabetes (5). Lipocalin-2 is an inflammatory marker that is closely correlated with insulin resistance (6). Its elevated level activates inflammatory signaling pathways in diabetic patients and is associated with the progression of cardiovascular diseases (7). RBP4 is largely produced in the liver and adipose tissues. A number of studies have reported high levels of RBP4 in subjects with diabetes (8). Some researchers have shown direct effects of RBP4 on insulin sensitivity by regulating insulin-glucose metabolism in skeletal muscles (9). RBP4 increases insulin resistance through peripheral suppression of GLUT-4 transporters (10). FABPs are also involved in the cellular intake and transfusion of fatty acids, regulation of metabolic and inflammatory pathways and modulation of gene expression (11). Increased circulation level of FABP is associated with endothelial dysfunction in subjects with type 2 diabetes (12). Also, this circulation level has been suggested as an important index for insulin resistance in type 2 diabetes (13). The role of regular exercise in improving insulin sensitivity and type 2 diabetes has been well documented (14). Therefore, diabetic patients can use exercise training to control their blood glucose, lipid profile, weight and blood pressure. Different types of exercise, including aerobic, resistance, and stretching exercises, can be prescribed for diabetic patients. It has been shown that resistance training and aerobic exercise can increase insulin sensitivity and daily energy intake and improve quality of life (15, 16). On the other hand, the positive effect of physical activity on the reduction of insulin resistance may be related to the change in the secretion of adipokines (17). It has been shown that resistance training at an intensity of 50% - 80% of one-repetition maximum for eight weeks is associated with a significant decrease in the concentrations of FABP4 and lipocalin-2 in obese adult males (18). Lim et al. also showed a decrease in the serum level of RBP4 after performing aerobic training in obese women (19). Contrary to this finding, in a study by Choi et al., after three months of endurance training, five sessions per week at an intensity of 60% - 75% of the maximum heart rate of subjects, no significant change in serum RBP4 level was reported (5). Due to the specificity of the effects of training, the combination of both endurance and resistance training is recommended for desirable and healthy body functioning in diabetic patients (20). However, there is limited information on the effects of aerobic and resistance training on adipokine pathways in diabetic patients. On the other hand, it is helpful to understand the mechanism through which aerobic and resistance trainings can improve and treat metabolic deficiencies. The level of adipokines can be related to metabolic effects and complications of diabetes, and the appropriate type of exercise for improving adipokine level related to diabetes can be a key factor in choosing an exercise program for diabetic patients. Therefore, the aim of this study was to investigate the effect of eight weeks of combined exercise on retinol binding protein 4, fatty acid-binding protein and lipopocalin-2 in diabetic women. The study population of this quasi-experimental study comprised all women with diabetes mellitus who referred to the Bojnourd Diabetes Association from May to June 2017, from whom 18 available volunteers were selected as the study samples. In order to implement the present research, first the researcher referred to the Bojnourd Diabetes Association. After explaining the implementation process for the person in charge, the list of people referring to the Bojnourd Diabetes Association was prepared and, after coordination by calling and holding an advisory session, the implementation of the present study was described for all the patients and the volunteers to participate in the research were registered. Eventually, 18 volunteers were selected as the samples of study. The inclusion criteria were fasting blood glucose between 150 and 250 mg/dL, type 2 diabetes based on a doctor’s diagnosis and at least three years elapsed since diagnosis. The exclusion criteria comprised renal, cardiovascular, parathyroid or digestive diseases and insulin use. All the subjects were asked to refrain from high intensity physical activity for 48 hours. After this time, according to the preset schedule, all the subjects were asked to be present at the laboratory between 7:00 am and 8:00 am. At first, the demographic and anthropometric characteristics such as age, height and weight were obtained, and then 5 cc of blood was drawn from the arterial vein in fasting state. Afterwards, based on body mass index (BMI), the subjects were assigned to two homogeneous groups of combined training and control. The combined training group performed a combination of resistance and endurance trainings for eight weeks, three sessions per week and each session for 60 minutes (21). The control group only had their daily activities during this time. At the end of eight weeks, 48 hours after the last training session, in the post-test, all the subjects attended the laboratory and 5 cc of blood from the arterial vein was taken in fasting state. Considering that most previous studies had reported that 8 weeks (18, 21), 10 weeks (19) and 12 weeks (5) of exercise were effective on the improvement of biomarkers of cardiovascular diseases in healthy individuals and patients with diabetes, this study examined the effect of eight weeks of combined exercise training. The exercise trainings included 10 minutes of warp-up and 10 minutes of cool-down. The main training program consisted of 20 minutes of combined training (including trainings to strengthen the major muscle groups, such as sit-ups, modified pull-ups, dumbbell lunges and push-ups), followed by 20 minutes of aerobic training at 60% - 80% of the maximum heart rate. Combined trainings involved three sets of 8 to 12 repetitions with 30-second intervals between sets. After completing each combination, each subject had 2 minutes of active rest and then moved on to the next training. Serum level of RBP4 was measured using an ELISA kit with a sensitivity of 51 ng/mL; serum level of A-FABP was measured using an ELISA kit with a sensitivity of 2.56 ng/L and lipocalin-2 serum level was measured using an ELISA kit with a sensitivity of 10.12 ng/L, all of which were made by Hangzhou Eastbiopharm Co. Ltd., China (Cat.No:CK-E11179). To analyze the data, Kolmogorov-Smirnov, covariance, independent samples t-test and paired sample t-test were run in SPSS. P value less than 0.05 was considered statistically significant. The research council of the Islamic Azad University, Bojnourd Branch, confirmed the research, and the principles stated in the Helsinki Declaration and the medical ethics were observed. The demographic characteristics of the subjects are presented in Table 1. The results of Kolmogorov-Smirnov test showed that the distributions of FABP in pre-test (0.93), FABP in post-test (0.96), RBP4 in pre-test (0.06), RBP4 in post-test (0.07), lipocalin-2 in pre-test (0.99) and lipocalin-2 in post-test (0.87) were normal. 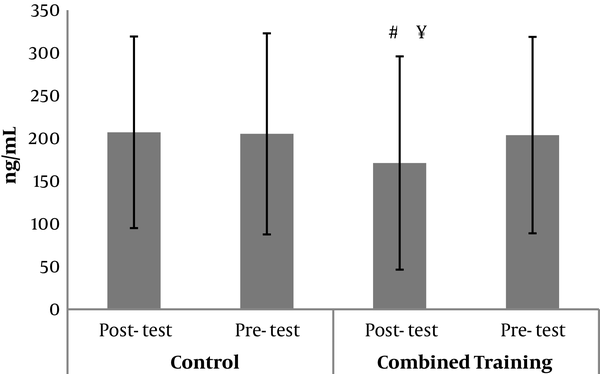 The results of the covariance analysis test in Table 2 show that with the elimination of the pre-test effect, FABP post-test levels in the combined training group were significantly lower than in the control group (F = 5.90, P = 0.02; Figure 1). Also, with the elimination of the pre-test effect, RBP4 post-test levels in the combined training group were significantly lower than in the control group (F = 8.22, P = 0.01; Figure 2). 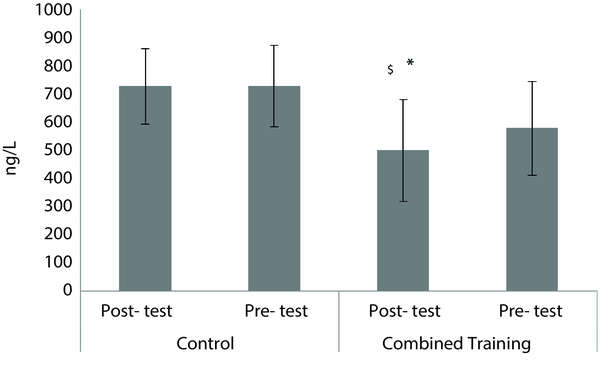 Independent samples t-test results in Table 3 exhibit that there was no significant difference in pre-test and post-test levels of lipocalin-2 in the combined training and control groups (t = - 0.17, P = 0.86; Figure 3). The results of paired sample t-test in Table 4 demonstrate that in the training group, FABP (t = - 2.50, P = 0.03) and RBP4 levels (t = - 2.93, P = 0.01) decreased significantly compared to pre-test; however, there was no significant difference in the pre-test and post-test levels of lipocalin-2 (t = - 0.17, P = 0.86). In the control group also, there were no significant differences in the pre-test and post-test levels of FABP (t = - 0.14, P = 0.88), RBP4 (t = 0.52, P = 0.61) and lipocalin-2 (t = - 0.40, P = 0.69). Figure 1. Pre-test and post-test levels FABP in the combined training and control groups. * Significant reduction compared to pre-test; $ significant reduction compared to post-test of the control group. Data are presented as mean ± SD. P ≤ 0.05, covariance analysis and paired sample t-test. Figure 2. RBP4 levels of pre-test and post-test in the combined training and control groups. ¥ significant reduction compared to pre-test; # significant reduction compared to post-test of the control group. Data are presented as mean ± SD. P ≤ 0.05, covariance analysis and paired sample t-test. Figure 3. 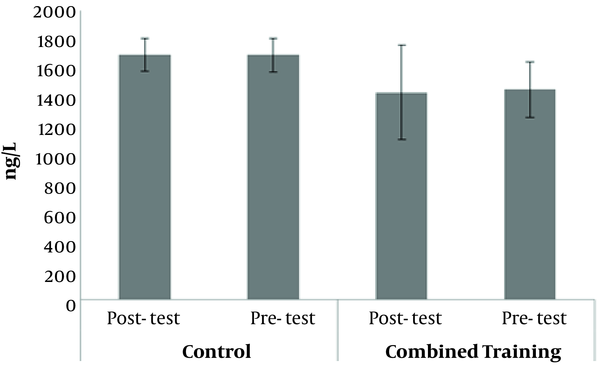 Pre-test and post-test levels of lipocalin-2 in the combined training and control groups. Data are presented as mean ± SD. P ≤ 0.05, independent samples t-test and paired sample t-test. The results of this study showed that combined training resulted in a significant reduction in FABP and RBP-4 in diabetic women. Among the consequences of type 2 diabetes are inflammatory status and increased RBP-4 level (18), and the results of this study showed that the training program could lower the level of this adipokine. The significant decrease in RBP-4 following exercise training in this study was consistent with the reported on subjects with type 2 diabetes in previous studies (5, 22, 23). However, there is much evidence to show that RBP-4 and FABP concentrations are increased in obese, overweight and diabetic individuals (7, 8, 12). Since exercise elevates the expression of mRNA and GLUT4 proteins in adipocytes (24), increase in GLUT4 can reduce the concentration of RBP-4 (25). Probably the increase in GLUT4 adipocytes due to compatibility with combined training can be a reason for reducing the concentration of RBP-4 in the present study. Reduced level of RBP-4 as a result of exercise may be due to the anti-inflammatory effects of regular exercise activity (26). On the other hand, the reduction in insulin resistance seems to be directly related to serum RBP-4 (27). It has been shown that RBP-4 stimulates the expression of phosphoenolpyruvate carboxylase kinase (PEPCK) and disrupts insulin signaling (27). Serum reduction seems to be one of the mechanisms that contribute to the improvement of insulin resistance, and endurance and resistance sports activities can play an important role in improving diabetes symptoms (28). Another important finding of the present study was the significant decrease in FABP concentration following eight weeks of resistance and endurance training in diabetic women. Similarly, another group of researchers observed a decline in the concentration of this index after eight weeks of resistance training (18, 29). The mechanism of FABP changes following exercise is not well defined (29). Some studies have proposed FABP changes after exercise stemmed from changes in fat mass and body fat percentage following exercise (29). Contrary to the findings of this study, there was no significant effect on the serum level of RBP-4 in athletes after eight weeks of training in a previous study (30). It seems that lower RBP-4 concentrations in athletes compared to diabetics patients and those with impaired glucose tolerance can be a reason for insignificant effect of training (30). This discrepancy in results could be attributed to the type and intensity of the training, sampling time after the last training session and the physical condition of the subjects. Consequently, Safarzade et al. attributed increased FABP concentration to the short duration of resistance training in their research and suggested that longer training periods could significantly modify this plasma index (31). Also, the results of the present study showed that eight weeks of resistance and endurance training had no significant effect on lipocalin-2 level in diabetic women. Lipocalin-2 has been shown to act as a responder to inflammatory signals, and the expression of this molecule increases in the face of oxidative stress and inflammatory agents (32). This finding is consistent with the results of Choi et al. (5). The lack of reduction in cytokine level after moderate intensity training could be due to hormonal changes and substrate metabolism, which were not addressed in this study. However, the lack of changes in lipocalin-2 levels in the present study was not consistent with the results of some previous studies (33, 34). It has been stated in a research that to reduce the lipocalin-2 level, training at an intensity higher than 45% - 75% VO2 max would be required (34). Based on the suggestions of previous studies, the possible molecular mechanisms for reducing this cardiovascular index can be adjusting adaptation and anti-inflammatory effects of exercise activities (34). According to results of the present study, type 2 diabetic women can implement eight weeks of combined resistance and endurance exercise to improve their serum levels of RBP4 and FABP. Considering that exercise intensity and caloric restriction can affect RBP4, FABP and lipocalin-2 in diabetic patients, future studies are suggested to examine the effects of exercises with varying intensities along with caloric constraints on RBP4, FABP and lipocalin-2 levels in diabetic patients. The author would like to express his deepest gratitude to all those who collaborated in this research. Ethical Considerations: The Research Council of Islamic Azad University, Bojnourd Branch confirmed the research, and the principles stated in the Helsinki Declaration and the medical ethics were observed (IR.MIAU.REC.1396.165). 1 Anik A, Catli G, Abaci A, Bober E. Maturity-onset diabetes of the young (MODY): An update. J Pediatr Endocrinol Metab. 2015;28(3-4):251-63. doi: 10.1515/jpem-2014-0384. [PubMed: 25581748]. 2 Olokoba AB, Obateru OA, Olokoba LB. Type 2 diabetes mellitus: A review of current trends. Oman Med J. 2012;27(4):269-73. doi: 10.5001/omj.2012.68. [PubMed: 23071876]. [PubMed Central: PMC3464757]. 3 Rabe K, Lehrke M, Parhofer KG, Broedl UC. Adipokines and insulin resistance. Mol Med. 2008;14(11-12):741-51. doi: 10.2119/2008-00058.Rabe. [PubMed: 19009016]. [PubMed Central: PMC2582855]. 4 Xiao Y, Xu A, Hui X, Zhou P, Li X, Zhong H, et al. Circulating lipocalin-2 and retinol-binding protein 4 are associated with intima-media thickness and subclinical atherosclerosis in patients with type 2 diabetes. PLoS One. 2013;8(6). e66607. doi: 10.1371/journal.pone.0066607. [PubMed: 23799122]. [PubMed Central: PMC3684582]. 5 Choi KM, Kim TN, Yoo HJ, Lee KW, Cho GJ, Hwang TG, et al. Effect of exercise training on A-FABP, lipocalin-2 and RBP4 levels in obese women. Clin Endocrinol (Oxf). 2009;70(4):569-74. doi: 10.1111/j.1365-2265.2008.03374.x. [PubMed: 18710473]. 6 Kamble PG, Pereira MJ, Sidibeh CO, Amini S, Sundbom M, Borjesson JL, et al. Lipocalin 2 produces insulin resistance and can be upregulated by glucocorticoids in human adipose tissue. Mol Cell Endocrinol. 2016;427:124-32. doi: 10.1016/j.mce.2016.03.011. [PubMed: 26973291]. 7 Wang Y, Lam KS, Kraegen EW, Sweeney G, Zhang J, Tso AW, et al. Lipocalin-2 is an inflammatory marker closely associated with obesity, insulin resistance, and hyperglycemia in humans. Clin Chem. 2007;53(1):34-41. doi: 10.1373/clinchem.2006.075614. [PubMed: 17040956]. 8 Cho YM, Youn BS, Lee H, Lee N, Min SS, Kwak SH, et al. Plasma retinol-binding protein-4 concentrations are elevated in human subjects with impaired glucose tolerance and type 2 diabetes. Diabetes Care. 2006;29(11):2457-61. doi: 10.2337/dc06-0360. [PubMed: 17065684]. 9 Tamori Y, Sakaue H, Kasuga M. RBP4, an unexpected adipokine. Nat Med. 2006;12(1):30-1. discussion 31. doi: 10.1038/nm0106-30. [PubMed: 16397554]. 10 DeBoer MD. Obesity, systemic inflammation, and increased risk for cardiovascular disease and diabetes among adolescents: A need for screening tools to target interventions. Nutrition. 2013;29(2):379-86. doi: 10.1016/j.nut.2012.07.003. [PubMed: 23022122]. [PubMed Central: PMC3578702]. 11 Cabre A, Lazaro I, Girona J, Manzanares JM, Marimon F, Plana N, et al. Plasma fatty acid binding protein 4 is associated with atherogenic dyslipidemia in diabetes. J Lipid Res. 2008;49(8):1746-51. doi: 10.1194/jlr.M800102-JLR200. [PubMed: 18421072]. 12 Aragones G, Ferre R, Lazaro I, Cabre A, Plana N, Merino J, et al. Fatty acid-binding protein 4 is associated with endothelial dysfunction in patients with type 2 diabetes. Atherosclerosis. 2010;213(1):329-31. doi: 10.1016/j.atherosclerosis.2010.07.026. [PubMed: 20723896]. 13 Xu A, Tso AW, Cheung BM, Wang Y, Wat NM, Fong CH, et al. Circulating adipocyte-fatty acid binding protein levels predict the development of the metabolic syndrome: A 5-year prospective study. Circulation. 2007;115(12):1537-43. doi: 10.1161/CIRCULATIONAHA.106.647503. [PubMed: 17389279]. 14 Lin GM, Li YH, Wen SH. Aerobic and resistance training for patients with type 2 diabetes. JAMA. 2011;305(9):891. author reply 891-2. doi: 10.1001/jama.2011.226. [PubMed: 21364137]. 15 Mansouri M, Nikooie R, Keshtkar A, Larijani B, Omidfar K. Effect of endurance training on retinol-binding protein 4 gene expression and its protein level in adipose tissue and the liver in diabetic rats induced by a high-fat diet and streptozotocin. J Diabetes Investig. 2014;5(5):484-91. doi: 10.1111/jdi.12186. [PubMed: 25411614]. [PubMed Central: PMC4188104]. 16 Pesta DH, Goncalves RLS, Madiraju AK, Strasser B, Sparks LM. Resistance training to improve type 2 diabetes: Working toward a prescription for the future. Nutr Metab (Lond). 2017;14:24. doi: 10.1186/s12986-017-0173-7. [PubMed: 28270856]. [PubMed Central: PMC5335813]. 17 Marinho R, Ropelle ER, Cintra DE, De Souza CT, Da Silva AS, Bertoli FC, et al. Endurance exercise training increases APPL1 expression and improves insulin signaling in the hepatic tissue of diet-induced obese mice, independently of weight loss. J Cell Physiol. 2012;227(7):2917-26. doi: 10.1002/jcp.23037. [PubMed: 21938726]. 18 Atashak S, Ahmadi-Zad A. [Effect of eight weeks of resistance exercise on new biomarkers of cardiovascular disease in obese adult males]. Feyz J Kashan Univ Med Sci. 2017;21(3):256-64. Persian. 19 Lim S, Choi SH, Jeong IK, Kim JH, Moon MK, Park KS, et al. Insulin-sensitizing effects of exercise on adiponectin and retinol-binding protein-4 concentrations in young and middle-aged women. J Clin Endocrinol Metab. 2008;93(6):2263-8. doi: 10.1210/jc.2007-2028. [PubMed: 18334592]. 20 Jorge ML, de Oliveira VN, Resende NM, Paraiso LF, Calixto A, Diniz AL, et al. The effects of aerobic, resistance, and combined exercise on metabolic control, inflammatory markers, adipocytokines, and muscle insulin signaling in patients with type 2 diabetes mellitus. Metabolism. 2011;60(9):1244-52. doi: 10.1016/j.metabol.2011.01.006. [PubMed: 21377179]. 21 Yousefipoor P, Tadibi V, Behpoor N, Parnow A, Delbari E, Rashidi S. [The effect of 8-week aerobic and concurrent (aerobic-resistance) exercise training on serum il-6 levels and insulin resistance in type 2 diabetic patients]. J Shahid Sadoughi Univ Med Sci. 2013;21(5):619-31. Persian. 22 Soori R, Ravasi AA, Darabi MR. The effect of concurrent (resistance-endurance) training on resting levels of RBP4 and insulin resistance in obese middle-age men. Sport Biosci (Harakat). 2015;7(2):157-70. 23 Ku YH, Han KA, Ahn H, Kwon H, Koo BK, Kim HC, et al. Resistance exercise did not alter intramuscular adipose tissue but reduced retinol-binding protein-4 concentration in individuals with type 2 diabetes mellitus. J Int Med Res. 2010;38(3):782-91. doi: 10.1177/147323001003800305. [PubMed: 20819415]. 24 Broch M, Gomez JM, Auguet MT, Vilarrasa N, Pastor R, Elio I, et al. Association of retinol-binding protein-4 (RBP4) with lipid parameters in obese women. Obes Surg. 2010;20(9):1258-64. doi: 10.1007/s11695-010-0200-5. [PubMed: 20544399]. 25 Yang Q, Graham TE, Mody N, Preitner F, Peroni OD, Zabolotny JM, et al. Serum retinol binding protein 4 contributes to insulin resistance in obesity and type 2 diabetes. Nature. 2005;436(7049):356-62. doi: 10.1038/nature03711. [PubMed: 16034410]. 26 Irving BA, Davis CK, Brock DW, Weltman JY, Swift D, Barrett EJ, et al. Effect of exercise training intensity on abdominal visceral fat and body composition. Med Sci Sports Exerc. 2008;40(11):1863-72. doi: 10.1249/MSS.0b013e3181801d40. [PubMed: 18845966]. [PubMed Central: PMC2730190]. 27 Promintzer M, Krebs M, Todoric J, Luger A, Bischof MG, Nowotny P, et al. Insulin resistance is unrelated to circulating retinol binding protein and protein C inhibitor. J Clin Endocrinol Metab. 2007;92(11):4306-12. doi: 10.1210/jc.2006-2522. [PubMed: 17726077]. 28 Ramzany N, Gaeini AA, Choobineh S, Kordi MR, Hedayati M. [Changes of RBP-4 and insulin resistance after 8 weeks of aerobic training in type 2 diabetic rats]. Metab Exe. 2016;5(2):89-98. Persian. 29 Moghadasi M, Abdollahpur N, Abdehgah E, Hosseini F, Hosseini SA. Effect of eight weeks resistance training on adipocyte fatty acid-binding protein in obese middle-aged men. Intl J Sport Std. 2014;4(10):1198-204. 30 Ahmadi N, Moghadasi M, Nuri R. Changes of serum retinol binding protein 4 levels following 8 weeks moderate aerobic exercise. Asian J Sports Med. 2013;4(3):208-12. [PubMed: 24427480]. [PubMed Central: PMC3880665]. 31 Safarzade A, Jafaee M, Talebi-Garakani E, Fathi R. Effects of four week progressive resistance training on plasma FABP4 and lipid profile concentrations in diabetic rats. Iran J Endocrinol Metab. 2014;15(6):538-44. 32 Owen HC, Roberts SJ, Ahmed SF, Farquharson C. Dexamethasone-induced expression of the glucocorticoid response gene lipocalin 2 in chondrocytes. Am J Physiol Endocrinol Metab. 2008;294(6):E1023-34. doi: 10.1152/ajpendo.00586.2007. [PubMed: 18381927]. 33 Domieh AM, Khajehlandi A. Lipocalin-2: Response to resistance training in obese young men. Int J Sport Stud. 2014;4(4):458-61. 34 Talebi-Garakani E, Hoseini-Andargoli M, Fathi R, Safarzade AR. [Changes of adipose tissue lipocalin-2 gene expression in response to one session exercise in the streptozotocin-induced diabetic rats]. Iran J Endocrinol Metab. 2012;14(2):178-84. Persian.